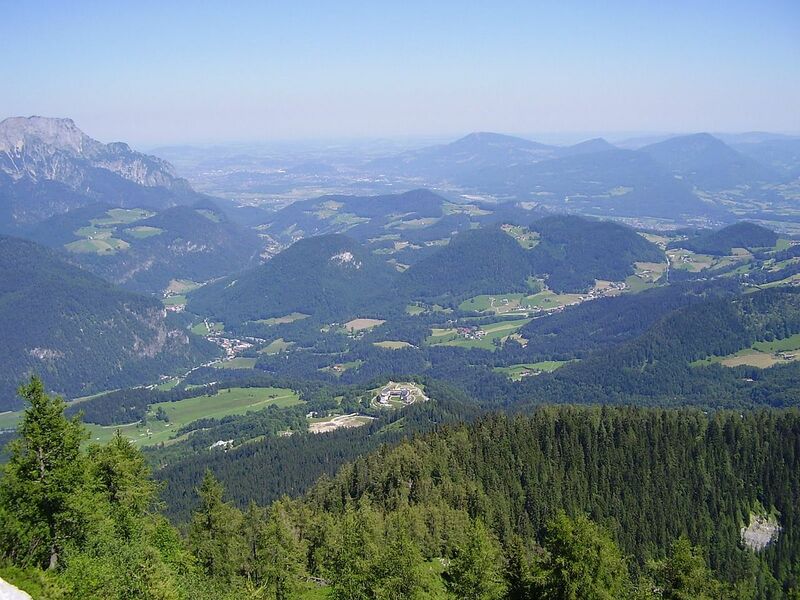 Of all Hitler’s residences during his time as a political figure, his favorite by far was his home on the Obersalzberg, near the picturesque town of Berchtesgaden in the Bavarian Alps. Not that anyone could blame him. Anyone with a taste for mountain views would be attracted to this spot. The Obersalzberg region, as seen from the Kehlsteinhaus. The large building near center is the Hotel Intercontinental, which stands roughly where Hermann Goering’s lodge once stood. Hitler first came to the Obersalzberg in the 1920s. He’d heard of the place while still in prison for the Beer Hall Putsch, and after his release he rented a small cabin on the Obersalzberg where he dictated the second half of his political manifesto/autobiography, Mein Kampf. 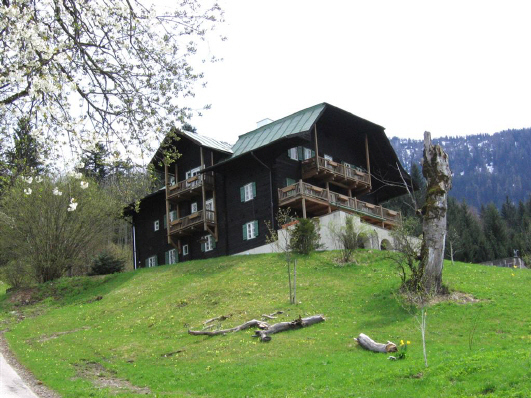 By 1928, Hitler’s financial position allowed him to rent a much nicer chalet on the Obersalzberg, which was named Haus Wachenfeld by the previous owner. Haus Wachenfeld as it was before renovations began. Haus Wachenfeld stood close to an old hotel on the Obersalzberg, the Hotel Zum Tuerken. 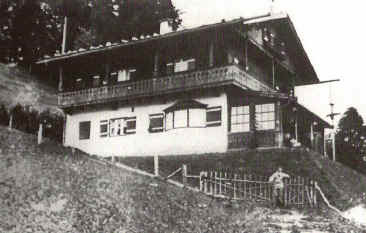 Once Hitler came to power, the Nazis pressured the owners of properties near Haus Wachenfeld to sell or gift their lands to Hitler’s inner circle. The Hotel Zum Tuerken was converted to a barracks for Hitler’s personal guard. An SS guard gate was built just down the hill from Haus Wachenfeld, and the area’s transition to Hitler’s private sanctuary was underway. 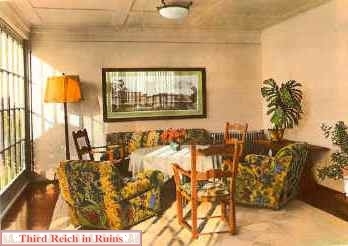 To fit Hitler’s new status, Haus Wachenfeld underwent a series of renovations. (To see them fully documented, visit this site.) A garage was added, along with a large terrace and an enclosed sunroom. But Hitler wasn’t satisfied. An amateur architect, Hitler planned and executed a renovation that would transform his mountain chalet into a giant chateau. Its new name would become infamous: the Berghof. 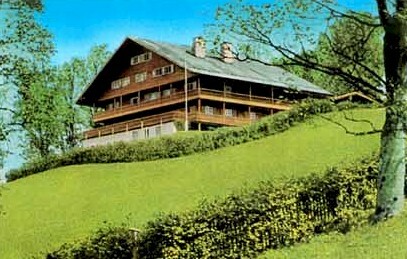 What’s unusual about the Berghof is that it actually retained about half of the original Haus Wachenfeld. Hitler simply decided to build the massive edifice around it, absorbing the old house into the new structure. The interior of the house was schizophrenic. Parts of it, like the Great Room with its Bond villainesque retractable picture window, were intended to overwhelm and intimidate. Other parts had a kind of bourgeois coziness. Welcome to my drawing room, Mr. Bond. Bormann chose his home wisely. Because it overlooked Hitler’s Berghof, he could monitor all the comings and goings of visitors and officials from his porch. Above is the final version of Landhaus Goering. Though it never achieved the fame of Goering’s Carinhall, he did enjoy spending time up here, and the spot gave him easy access to Hitler, who was a frequent visitor. And here is Albert Speer’s house. Hitler wanted to keep his favorite architect near him for consultations during the 1930s, when he was spending much of his spare time dreaming of the gigantic edifices he’d build throughout Germany once the Third Reich had gained its “living space” in the East. Speer was often stuck at the Berghof with Hitler, talking about these plans late into the night, and sometimes all night. Speer’s house, unlike the others, is still standing. It is a private home. Also worth mentioning are Hitler’s two teahouses on the Obersalzberg. Hitler drank his own peculiar tea brew, which he imagined to be more healthful than the coffees his entourage favored. 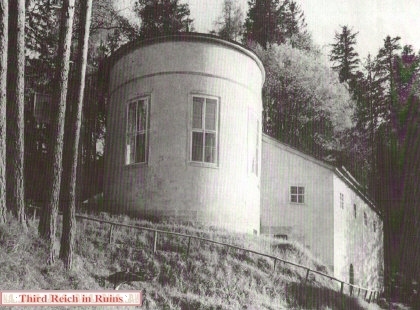 Hitler generally took tea at the Mooslahnerkopf Hill tea house, which was built for him in 1937. This tea house, down the hill from the Berghof, was the end point of Hitler’s daily afternoon walk. Joining Hitler on one of these walks was a special privilege, affording the lucky so-and-so a chance to gain further insight into the Fuehrer’s wishes, which could then be translated into working policies. 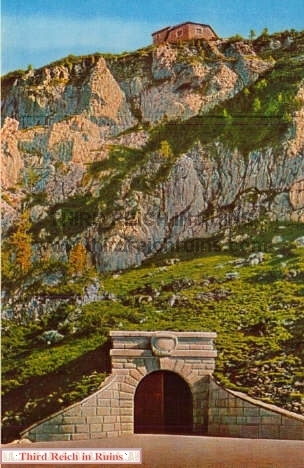 Martin Bormann built Hitler’s other, more spectacular Tea House, the Kehlsteinhaus, which was named “Eagle’s Nest” by a French diplomat. Architecturally speaking, the Kehlsteinhaus is something of a marvel, built high atop a peak, commanding spectacular views of the valley below. Its message to visitors is, “I am Hitler, Lord of all I survey.” Ironically, Hitler used it seldom. 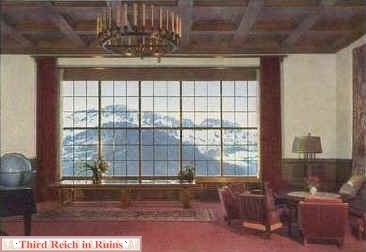 Hitler loved alpine views, but disliked heights. 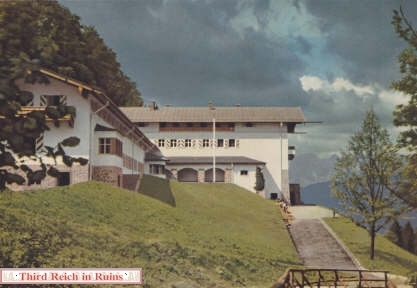 Also, unlike Hitler’s other tea house, which was an easy walk away from the Berghof, the Kehlsteinhaus had to be reached by car and then by elevator, making getting there more of a production. As it turned out, Eva Braun used the building much more often than her boyfriend did. 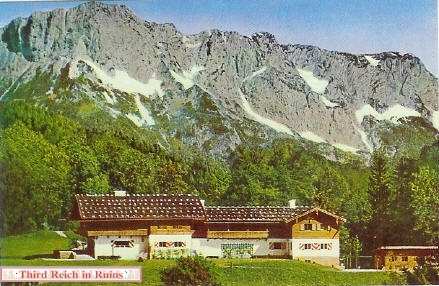 One amusing incident did take place at the Kehlsteinhaus. In 1939, Hitler brought a diplomat from the League of Nations to his grand tea house in order to give him a taste of his greatness. While Hitler was showing off the view and expounding, a servant came in with a heavy chair. The servant stumbled, and he dropped this chair right on Hitler’s foot. Hitler hopped about the Great Hall in pain, looking like a cartoon character. It was quite a mood breaker, and it probably took all the diplomat’s years of training in tact not to bust a gut. Still, the humor is marred by the knowledge that the servant, at the very least, lost his job, and that not long after this, Hitler invaded Poland and launched a war that killed over 50 million people. Previous: Previous post: Is It Your Dream To See Me Read Fiction? Next: Next post: How Many Stories About Death and Loss Can Jim Take?